"Great Week For Training In The Northern Forest!" 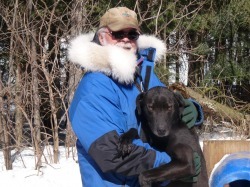 It was a great week here for mushing with some new fresh snow and cooler temperatures making it great for training. We started this week to increase the mileage to 8 mile runs this week. We were able get in 4 days of training for the first time this year. We have also set up a rotation program for training leaders and giving them all opportunities to work in different combinations. With the colder temperatures the lake has frozen across and with the forecast for little snow over the next 14 days, we should get a good ice base. Most of the kennel jobs, requiring to be finished for the Winter, have now been completed. This week we have a new addition to the Miortuk Team. It is my pleasure to announce that Cecile Hue has joined the the team for the balance of the season. Cecile is from Bretagne, France.